A base class for lists of entries that are extracted from a particular section, such as range lists or location lists. Definition at line 38 of file DWARFListTable.h. 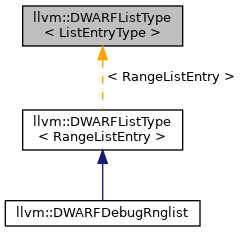 Definition at line 48 of file DWARFListTable.h. Definition at line 47 of file DWARFListTable.h. Definition at line 210 of file DWARFListTable.h. Definition at line 46 of file DWARFListTable.h. Definition at line 43 of file DWARFListTable.h.